Race Reports | Blackhill Bounders Running Club. Club Support & Social 1 – No club support this year apart from Mike and Shaun who were also running but the marshals were ace. In Short A lovely challenging Marathon right on the doorstep with 3,500ft of elevation. After last year I said to myself “never again”, but the lure of 26.2 miles right on the doorstep, with no travel or accommodation costs, proved too much – and it’s another step towards the bronze award for 25 Marathons. Another plus is it’s an amazingly beautiful place to run. After running London recently, the two races are at opposite ends of the spectrum in terms of route and spectators, but both are equally rewarding for very different reasons. One, the biggest Marathon in the world, the other, contains just a few elite athletes, or is that “crazy”! This year saw the run opened up so people could run as many laps as they liked. There were 23 finishers in the Marathon, who all did 5 laps of the course. 4 runners did 4 laps, 6 runners did 3 laps, 3 runners did 2 laps, and 4 runners did 1 lap. Many of the Bounders reading this will have done the Fruit Bowl and will be familiar with the course as it’s remarkably similar. The start is at the end of the walled garden – where the parkrun starts. You then head off down the hill, to where the sign-in office is at the entrance. You then take a sharp left and the first hill. You stay right, and go up, up, and up, till you reach the top. The trail flattens a little then rises again, and again, until it falls as you end up at the bottom of the octagonal pond. Round the edge of the pond you go, and once again you go up, up, and up, all the way to the top of the skyline – where Nigel is normally stood at the Fruit bowl. Then comes the lovely long clatter down, and down, till you hit the sharp left that takes you past the drift mine and the most horrible little click on the whole course – it saps your legs like no other little incline! The path then emerges at the octagonal pond again, where you turn right, then right again, for another long stretch of downhill – past the monument, all the way to the sharp left turn through the trees, and onto the riverside path. Thankfully you pass the Fruit Bowl climb up from the river, and continue over the new bridge till you get to a sharp left, then up the path to the steps past the Ice House and back onto the avenue. Now comes the sadistic bit! You then turn left and run along to the corner where you then turn back on yourself (this little loop is just not right!) then back along the avenue to the walled garden and the start/finish line. You do this another four times! Turned up at registration around 4:15 and had a bit crack with some familiar faces. Our very own Shaun; Lynne, David and Louise from the Derwent Valley Trail Runners, and Anna Seeley from Elvet, who has become a bit of a running companion of mine at these NEMC events. As I looked around once again, the field was full of crazy ultra runners, and it made me feel a little nervous. My mind however reminded me that after HM30, I am now one myself – even if it’s not quite the Lakeland 50, the HM110, or the Comrades. Start time was 5pm but they were letting people start earlier if they wanted to – so a quick check in at the start with George Routledge, and me, David, Lynne, and a couple of others, were off 15 minutes early. Mike Gill was just dropping his bag off when we started. David disappeared off into the distance – oh to have youth on one’s side! I pulled away from Lynne after the first hill and found myself running and chatting to a guy called Paul, from Ponteland, who had been running just a little longer than me. We chatted all the way round the first lap which was a little on the quick side and he was telling me all about running from Glasgow to Edinburgh along the canals (now there’s a thought!) He left me at the water station at the start finish line, where I gulped down the water and started the 2nd lap. From now on I was on my own, apart from passing the odd runner and being passed by the faster guys, including Shaun, who started at 5pm. Laps 2 and 3 passed without incident and I walked the click up from the Lead Mine each time (a horrible short hill). Lap 4 was a different story as the legs began to tire the Achilles began to scream, and my hamstrings were in overdrive. However, despite that I kept going. The evening bird song was a delight and the intermittent light rain was lovely – as were the downhill sections. Lap 4 done, now lap 5. The year before, me and Steve Collins were joined by Ian Young, and if Ian hadn’t been there I may have walked most of it. This year I ran nearly all of it, even if it was more of a shuffle than a run, knowing I was on course to beat last year’s time. I crossed the line in 4:29 (4:30 including the wee stops… too much information? ), which I was pretty happy with. I saw Mike a couple of times at the pond during the race, which was a huge boost. Another 26.2 miles completed, and I was remarkably in good shape at the end. Excellent event, and well done to Mike and Shaun. Will I do this one again? Probably, but there won’t be any PB’s involved. After running 3:43 in London, and being around 3:50 at both Manchester and Edinburgh, the 4:30 here shows how tough the course is – but its a belter, a proper belter – if you don’t mind laps! You notice something different about the estate and its wildlife on each lap. This is a must do race for anyone who enjoys long trail runs, and who loves a challenge – it surely is a unique race. There’s one word always seems to sum up the experience of running at Kielder for me – surreal. If you’re wanting to dip your toe into the world of trail running, or just looking for an alternative to pounding the pavements along your local streets, this one really is fab. I did the 10k race last year as one of my first, and loved it enough to sign up on opening day this year. There’s something really special about running here, it is not by any stretch of the imagination flat, but it is probably the quietest race I’ve ever done and with such a gorgeous setting it really is one to kick back and enjoy. 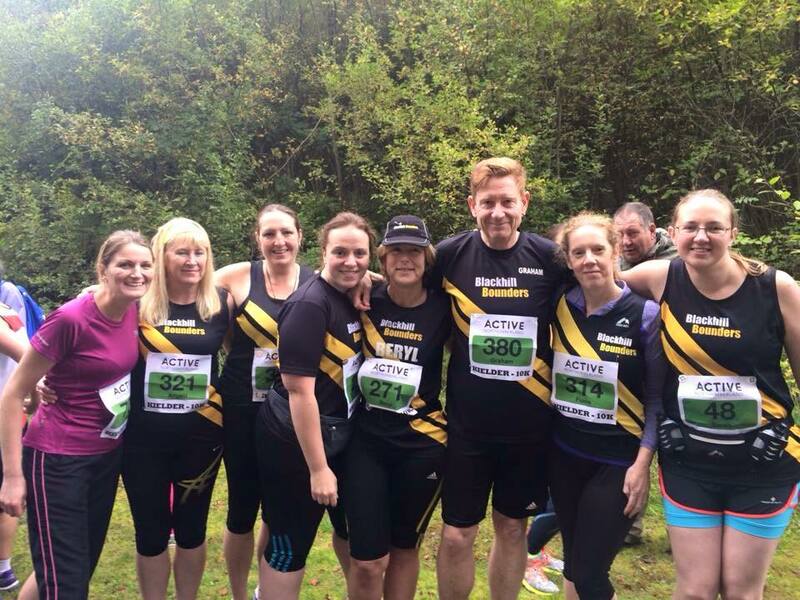 I’d turned up in 2014 with no real preconceptions as to what to expect, quietly hoping to beat my last 10k best I’d set at the Gateshead Trail 2 months before, and looking forward to running somewhere new – it was the first time I’d been to Kielder after being on the ‘investigate’ list for a while. 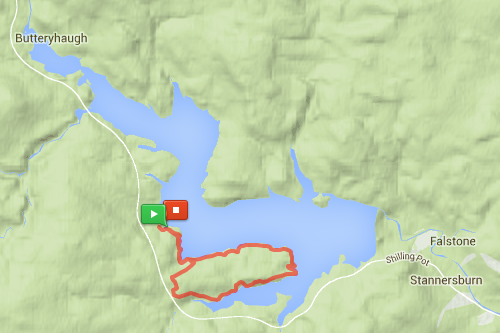 There is a very prominent feature in the Kielder 10k route around the peninsula…and I don’t mean the lake. Between the 1km and 2km mark is a very long, rather steep hill – traveled in the up direction. Last year, I thought that was me done and seriously considered bailing out and heading back to the start line thinking the whole thing was going to be like that and it would be the end of me. I made it (slowly) to the top – where the kind marshal souls had set up a water station – and wrote off all possible thoughts of a pb, focused my mind on getting round and set off again. It was the most zen 8k I’ve ever ran. I just switched off, enjoyed the views and the woodland stretches, and made it to the finish line – 2 mins quicker than my last pb. Take that, hill! This year, I was set up to take a similar approach – this is a course route to be enjoyed not just completed. I would do whatever I had to to get up that hill just so I could run the rest of it again. As it happens, my memories of the hill from last year had made it much steeper than I found it this year with something to look forward to. It was still there, still a hill, and still long, but it was conquerable. Get it out the way and you can enjoy the rest. Get up it any way you have to – run, jog, power-walk, walk, stagger, crawl. It’s ONE hill and then you’re onto ‘undulating’ :) That’s your reward. I loved every minute of this year – even the hill. I don’t actually know where the first 3km went before they seemed to be behind me. It felt like it took so much less time than the year before. I had my eye on another Bounder vest that had left me behind by the 7km mark at the Gateshead Trail and I was determined to keep it in sight at the very least this time! There were quite a few of us there this year, and more on the half and full marathon courses for Sunday. One of the things that reminded me how special this route was to me last year, was how well I remembered it – I’d done it once and haven’t been back on my own since, but I remembered stretches of it like I’d been there last week. Many races have stretches of spectators cheering you on at stretches, the route at Leaplish Park doesn’t really lend itself to this – the marshals are great for waving you on, but the spectators tend to stay at the start/finish area. It makes this a really quiet course – there’s no traffic noise, most runners were in their own little worlds or concentrating on keeping their breathing steady, even the wildlife was quiet (which in the case of the last of the midges was a blessing!). Just in case you’ve gotten a little too zen with me in the woods, the course will bring you back into race mode in the last 3km – wake up for those last few short hills, the photographer’s watching, you’re pretty sure you can see the finish line marquees around that last corner of the lake, it really can’t be far now, you must be nearly there! Nah, you have to go round this corner through the woods first – but it’s OK, because there’s motivating music playing at you! You can hear the guy on the tannoy cheering people across the finish line! He’s saying your name! Do you have a sprint finish left in your legs before you turn into a jelly pile in the finisher’s tent? Of course you do! Even if it’s just to get you across the line that little bit sooner. You made it. You’ve just completed a run that will become your favourite 10k course – if it doesn’t, you need to share because you’re obviously running somewhere incredibly special and I want in on it! Seriously, most visible person in Northumberland in this. Kielder medals are always fab, and if you’d been there this year you’d have this bad boy to hang up when you got home. This year, they’re really looking out for you coming into the winter too – your apparel swag is a bright orange t-shirt, no-one is going to miss you coming, and maybe if you were really unlucky that ‘Steep Decline’ sign will remind you of an inadvertent tumble on the gravel – I know there were one or two skinned knees across the weekend this year! You can run this in road shoes (I did – intact!) – the paths are good and firm, but trail shoes can give you just that little bit of extra grip on any loose gravel sections! We all made it round just about in one piece (a few dents and a broken watch between us); bananas, drinks and Mars bars all round! I can also really recommend the cake tent – I filled my face with orange sponge and it was delicious – and all homemade too! Have you signed up for 2016 yet?! Because you really should! See you there!